An exciting round of 16 saw less goals but rather some gutsy battles that went the distance. The total goals at the tournament have already eclipsed that of the 2010 FIFA World Cup and there are some riveting ties set up for the Quarter Finals. Without any further babble, let’s get into the review of the Round of 16. Although we were treated to less goals this round, there were still some pearls. Giovani dos Santos and Wesley Sneijder both hit bolts. But ultimately you have to look to the man who leads the scoring charts. It was a beautiful cushioned chest into a blitzing volley that had the decency of going in off the crossbar. James Rodriguez goal will be on the top 5 list at the end of the tournament and for many might top it. And of course it was not just his goals that caused him to have an outstanding round. The Monaco man’s all round play has been outstanding and has seen him mentioned as a possible signing for multiple clubs. Of course that touting is by those that forget just a year ago that Monaco paid 45 million for him. His stock has risen and Colombia’s chances have increased as a result. Firstly, the penalty was a penalty. 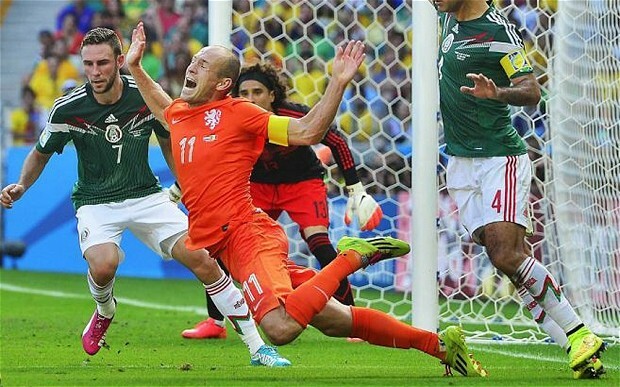 It was a poor tackle by Rafael Marquez and although Arjen Robben went to ground more theatrically than Evita Bezuidenhout talking politics, it was a penalty. The controversy is more akin to his dive in the first round. It was atrocious, without class and should have received a booking. Robben, like Ronaldo, is a world-class footballer, who should let his football do the talking rather than his theatrics. 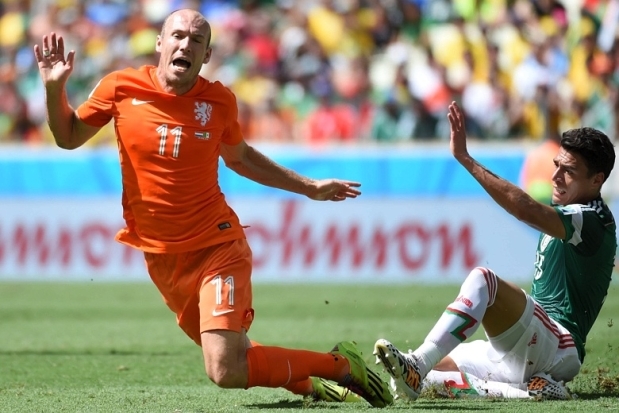 He gets a second award too this week as post game Robben openly admitted that he dived. It’s almost like he is begging refs to send him off. I wouldn’t be surprised to see a French defender leave a foot in. Colombia are probably the only winning team from the Round of 16 that truly dominated their game. From the first minute until the last Colombia looked like they would beat Uruguay and they duly delivered. It was also the only game where the losing side was well outplayed and not really in the game in the 90 minutes. Oh yes and this is all without their star man Falcao. As there were no out-and-out upsets in the Round of 16, the biggest upset was probably this game in the sense that Uruguay were never in the game. Without Suarez they really lacked the bite (hahaha), and their attack was toothless (hahaha). But while Uruguay were poor, Colombia were outstanding and this one was never really much of a contest at all. Algeria and Germany produced a classic match, but the final game of the round of 16 produced the best match. 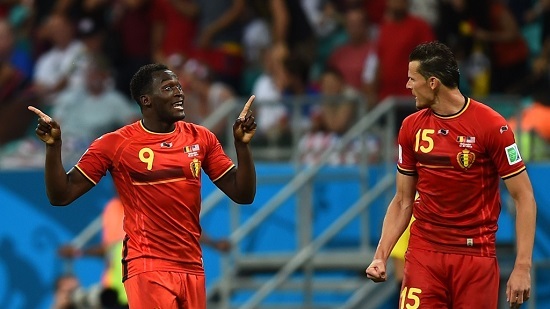 Belgium battered away at the USA goal with Tim Howard making a record-breaking 16 saves. USA had a chance to win it in the 92nd minute but missed a sitter. Belgium scored two in the first half of extra time, USA got one back and then spent the time camping out in the Belgian half. We also saw arguably the greatest free kick move ever seen. It deserved a goal. The only pity about this game was the extra time ended! Let me know your thoughts from the Round of 16 on Twitter.